NETGEAR makes it easy for you to have the smartest home in the neighborhood, with the latest, fastest networking technology. Smart Home devices and other WiFi enabled devices are growing in popularity. As you grow your Smart Home, your network may not be able to support the WiFi demands of today and the future. NETGEAR’s range of easy-to-use products can help you stream movie night more often, watch almost anything on your tablet without buffering, and get the WiFi performance you need. At NETGEAR, they focus on all things connected, with the goal of making your online experience seamless so you can sit back, relax and do more. From dead zones in the far corners of your home to an overall poor signal, are you in a situation where your existing WiFi is struggling to keep up with the demands of your household? NETGEAR designed the Orbi WiFi system with the idea of an expanding home network in mind. 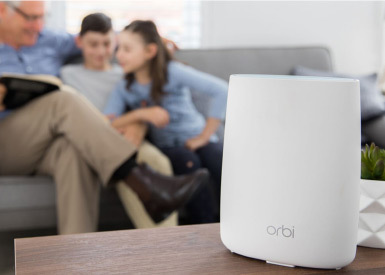 With the Orbi WiFi System, your WiFi is taken to the next level with a new type of WiFi technology: Mesh WiFi. Mesh WiFi enables great features such as: One Network Name, Seamless Roaming, and a Dedicated Backhaul. This group of three features, also known as FastLane3 Technology unique to Orbi, enhance your home WiFi experience to now have a single network name for simple network management, move around the home without dropping WiFi connection, and receive the fast WiFi speeds you pay for throughout your home. Do you already own a powerful WiFi router or are you unable to replace your current rented equipment from your Internet Service Provider (ISP)? With NETGEAR’s Mesh Extenders, you can easily build your own Mesh WiFi System using your existing equipment! 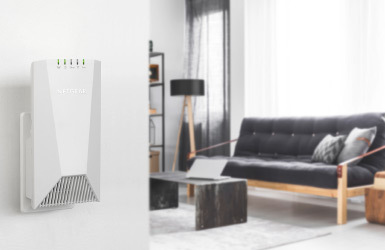 Like the Orbi WiFi System, the new Mesh Extenders utilize FastLane3 technology so you can enhance your current network without having to replace your existing router or ISP provided equipment. The number of Smart Home devices in the average home is on the rise. There’s no doubt that in present to near future, you will be connecting your security cameras, thermostat, lights, laptops, smartphones, smart TVs, gaming systems and much more to your network. 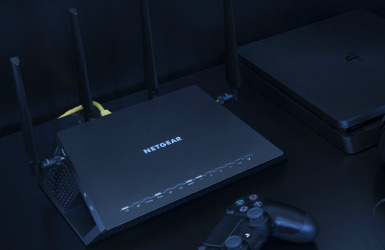 By having an up-to-date router, you are able to support all your devices as they connect to the internet. A high-performance router is essentially a large, newly paved, multi-lane highway for your data to quickly move in and out of your home. Additionally, our NETGEAR’s routers come with comprehensive Smart Parental Controls, Circle with Disney. Stay up to speed with a new WiFi router from NETGEAR. Every network and home is unique. NETGEAR turns ideas into innovative networking products that connect people and advance the way we live. This includes various options whether you need a whole home Mesh WiFi solution such as Orbi, prefer the networking powerhouse of a WiFi router, or choose to enhance your network with a Mesh Extender. Easy to use. Powerful. Smart. Find the right solution designed just for you with NETGEAR at London Drugs. Your current network may have different network names; one is for the 2.4GHz channel and one for 5GHz. Both networks have different performance and advantages. When connecting to your network, which should you use? FastLane3 solves this question by visually combining the two networks into one and connecting your device to the correct network for optimal performance ensuring you have the fastest speeds possible. Before Wi-Fi Systems, traditional extenders were the only way to increase Wi-Fi coverage in more places. With different network names for the router and the extender, it was not a seamless experience whatsoever. Your device would be limited in the capabilities to automatically hand-off Wi-Fi connection between the router and extender, so one would have to manually switch between router and extender when moving throughout a home network. With FastLane3, you can move throughout your home seamlessly without dropping Wi-Fi. Like a complex highway, your network can only allow so much internet traffic in and out of your home. Your network may get congested and slow down when you are streaming your favorite TV show, gaming, or simply browsing the web. With FastLane3, you are able to have a dedicated lane for data to pass between your devices, in and out of your home. This improves the reliability and speed of your Wi-Fi compared to traditional extenders. Ultimately, you are able to get the Wi-Fi speeds you pay for throughout your home, and on multiple devices all at the same time. NETGEAR is bringing peace of mind to parents by providing the parental control tools to manage online content and limiting the time that children are spending online. Available on the Orbi Wi-Fi System, Circle with Disney is the smart way for families to manage content and time online, on any connected device. Circle with Disney is a smart way for families to manage content and time online, on any connected device. This feature rich app is ideal for a multi-user, multi-device household when you want to set time limits for internet use for applications or devices. With the easy-to-use Circle app – available for download on both iOS and Android devices – parents can easily create unique profiles for each family member. This includes creating daily time limits for apps and websites, setting individual filter levels for each family member, scheduling BedTime for each family member and their devices, and pausing the internet by device or by user with the press of a button. You can even manage your family’s mobile devices outside the home through Circle Go. WHY DO I NEED A MESH EXTENDER? Just like the Orbi Wi-Fi System, Mesh Extenders give you features like: One Network Name, Seamless Roaming, and a Dedicated Backhaul. All these features come together for a full solution to enhance your existing Wi-Fi without compromising speed like a traditional Wi-Fi Range Extender. Mesh Extenders are the perfect solution for getting faster Wi-Fi speeds to more devices for those who already have and love their existing premium router, or those who are locked into renting gateway modems from their ISP. Transform your Wi-Fi into a Mesh experience by simply plugging in the extender and syncing it to your router. You are now ready to stream videos and music, and play games simultaneously, without any stutters or buffering, all while using your own equipment. Need a little more range for those hard to reach areas in your home? You can simply add additional Mesh Extenders to your network to cover every single corner with high performance Wi-Fi.